In the midst of an era dominated by ecommerce, there is still an undeniable need for family-run, brick and mortar board shops. Nothing can replace the nostalgic feeling you get when you walk into a local surf shop, and are warmly greeted by their friendly staff, excited to chat about the recent swell while you’re purchasing a bar of wax. That moment defines this unique culture and drives the action sports industry. It’s what keeps us paddling out, even on flat days, just to get our feet wet. In honor of these specialty retailers, TransWorld Business, a leader in boardsports news, has launched a new feature entitled 30 Shops in 30 Days. Throughout this month-long series, TransWorld Business will highlight a new shop every day. Each spotlight will feature the shop’s unique story through an exclusive interview and a behind-the-scenes tour. To kick off their 30 Shops in 30 Days series, TransWorld Business chatted with the crew from Sawyer Land and Sea Supply in Santa Cruz, California. Since then, they’ve featured shops around the nation, including Cleanline Surf Shop in Oregon, Bikle’s Snow, Surf & Skate in Maryland, Wetsand Surf Shop in California and many more! For 30 days, TransWorld Surf is giving shops across the country a loud voice in this noisy, online world. Support your local shop and checkout the TransWorld Business #30Shopsin30Days featured series. Own a board shop? 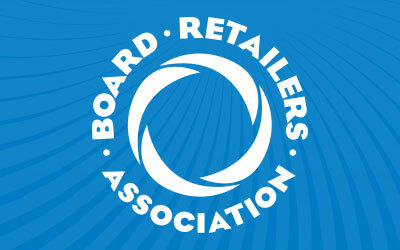 Join the Board Retailers Association and find out how we help protect specialty retailers and the board sports lifestyle.